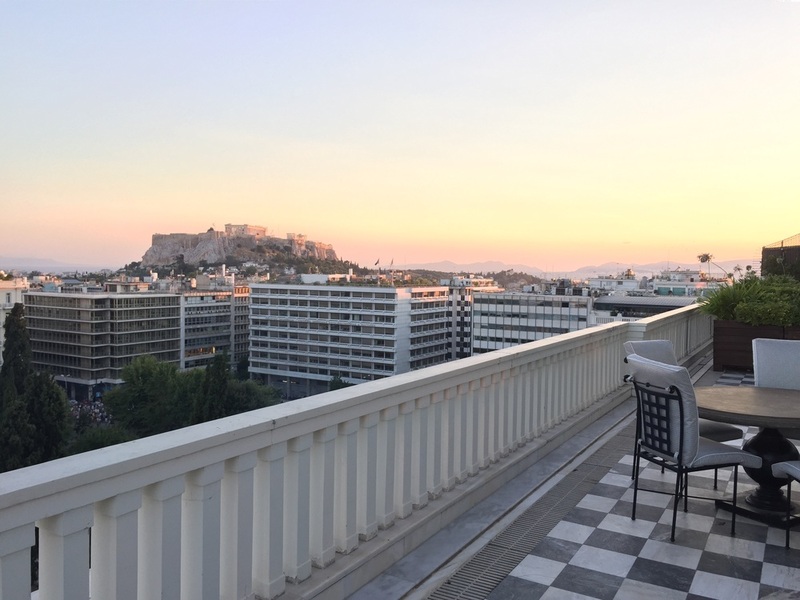 First of all, yes: The Grande Bretagne is the first house in Athens and place to stay. Magnificent location, best views, most luxurious interiors, first class service and long history. Some may ask if the location is safe. 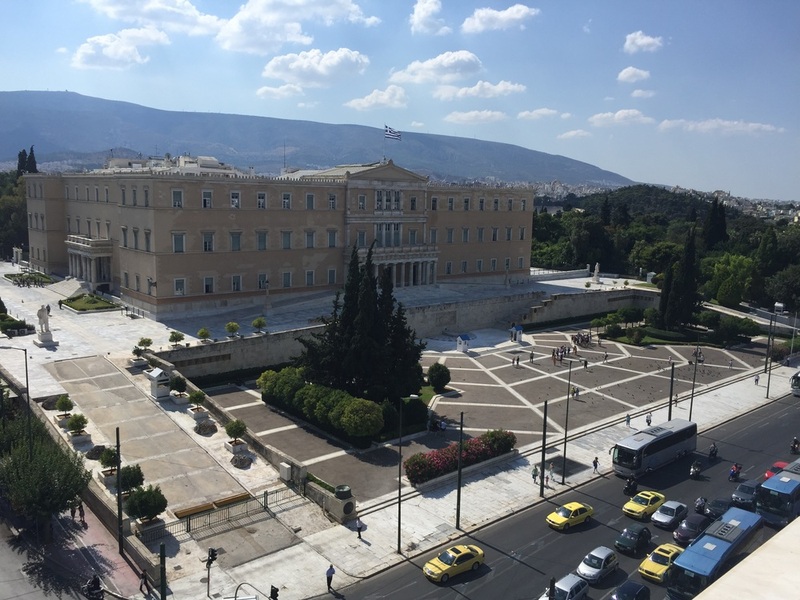 In our case there was an unfriendly demonstration on Syntagma Square - directly where the hotel is. So all blinds were shut down and arriving at the most luxurious hotel in Greece was just terrible, we felt ungood, unsafe - like arriving in a civil war. However after we entered the heavy doors and passed by the several security guards, we felt safe and were just impressed by the wonderful interiors of the hotel. We were asked to do the paperwork and soon afterwards we were accompanied to our Upgraded room - we booked a Classic Room and got a Deluxe Room on the Butler Floor. The room itself was very small - the bathroom as big as the main room, but maybe it is called a Deluxe Room because of the terrace which was truly spacious for a city hotel. Our view was towards Lyabetticus hill and the Parliament. Air Condition went well and the room was very clean at arrival. I really liked the bathroom with walk-in shower and seperate deep tub. Unfortunately the toilet was not seperated but it was no problem. I requested Molton Brown toiletries and they were already in the room at arrival which is a nice touch, also Shoe Shine service was complimentary and was truly fast. In general all extra wishes are done properly and fast - much appreciated! The staff is always on site and everyone is open for questions or feedback. Well I am the one who has not yet been convinced by the "so amazing" butler service (see article about our Suite stay at the Savoy London). Still after our stay I would never pay a surcharge to stay on a Butler Floor Room - it simply is not a Club Floor (I accept to pay for a Club Lounge where I get food and drinks). During our stay we saw that at the reception of the Butler Floor guests were served glasses of Champagne, unfortunately we never got something like that nor (we were not even offered refreshments after exhausting sightseeing on the Butler Floor) did we feel more welcome then in another Luxury Collection property. When we came back to our room there were still pieces of glass on the bathroom floor - which is very dangerous by the way - and the bed cover was dirty and already had a hole. Also the packaging of the slippers has not been removed - all in all I would say that the housekeeping was not as good as we expected from such a worldclass property. On the 7th floor there is a wonderful rooftop pool with views of the city and Lyabetticus hill. Unfortunately the lady only hands one towel to every guest (which is no longer state-of-the-art for such a renowned property) and she did not care about the children jumping into the pool nonstop and making the water slashing to us and everywhere else on the terrace! I am not against children at pools but it would be nice if they could take care to other guests. Due to the fact that there were and will remain protests in Athens, the Grande Bretagne was my only choice to stay.